Yesterday the price rebounded from the level of 50% from the previous ascending movement. It looks like the bears decided to slow down a little bit; however, the price may start a new descending movement quite soon. 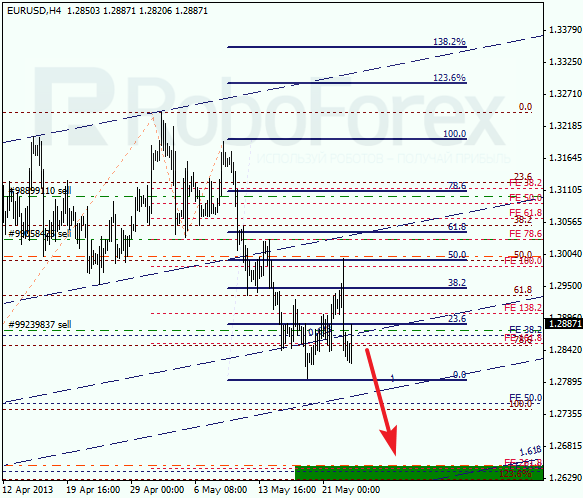 The target is the area where there are several important fibo-levels and line of 1.618 from fibo-channel. At the H1 chart, a possibility of breaking the minimum is even stronger. According to the temporary fibo-zones, predicted levels may be reached within the next several days. Later these levels may become a starting point of a deeper correction. Franc started a correction, but it is very unlikely to take much time. Later I expect the pair to continue growing up and break maximums. There is a possibility that the pair may try to test the level of 38.2%. If the market rebounds from this level, the pair will start growing up. According to the temporary fibo-zones, predicted levels may be reached quite soon.